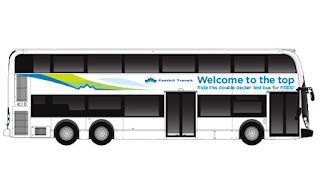 TransportiCA: [TransportNews] Foothill Transit: Double-Decker Debut! [TransportNews] Foothill Transit: Double-Decker Debut! Foothill Transit customers will soon get to try out a new double-decker bus. You can go straight to the top. We’re always looking for innovative ways to give our customers a high quality experience, and our newest project is the double-decker bus. Now, you get to try out a demo model of a double-decker bus, and then tell us what you think. We will have special Silver Streak trips served by a special double-decker from October 3 to October 7. If you catch the bus, we’ll let you ride for free! All we ask is for your two cents: fill out a short survey on board. For now, you can find about what makes double-decker buses so special. Where did Foothill Transit get the idea to try a double-decker bus? Double-decker buses have the special capacity to seat a lot of customers at once while taking up less space on the road and still deliver a very comfortable ride. It’s something a little different for California streets but common throughout the world’s largest cities. What are the advantages to adding a double-decker to the fleet? The double-decker can hold 80 seated customers at once. Like we said above, it doesn’t take up a lot of space, either on to road or in our bus yard even with all that capacity — it’s only 40 feet long. It’s low-maintenance. And on the road, the double-decker has very good maneuverability. Are there any challenges to using a double-decker? Well, it has two stories, so clearing low trees could be a potential challenge. We’re working with local cities to determine the safest routes for double-decker use. The bus is 13 feet and 6 inches tall. It does clear all freeway overpasses. Keep in mind that the height of the second level is only 5 feet, 7 inches, so customers who are taller than 5 foot 7 should plan on staying on the first level for comfort. Another unknown we might face is the time it takes for customers seated in the upper level to exit the bus when they reach their stops. This is why we’re testing these vehicles on our system. Why is Foothill Transit trying out this bus now? Alexander Dennis has a demo bus that they have been demonstrating all across the US. When we called and asked to participate, they gladly agreed. What about Foothill Transit’s commitment to have an all-electric fleet by 2030? As part of our full electrification initiative, we will require an electric-powered double-decker bus for our fleet. Alexander Dennis has demonstrated an electric version in the UK already. This demo model won’t be electric, but any double-deckers that permanently join our fleet would be. Is there anything special about this particular double-decker bus? It’s the only double-decker bus on the market that meets FTA’s Buy America requirement. Alexander Dennis has a plant in Indiana where the buses will be built. It also has a low-floor height at 13 feet, 6 inches for easier boarding compared to the higher version at 14 feet, 6 inches that is used in the UK. Who else is using double-decker buses? Other transit agencies have implemented the double-decker buses in their fleet, like Community Transit in Washington, RTC in Las Vegas (they have 130 double-deckers), and AC Transit in Oakland is the process of purchasing 25 buses from Alexander Dennis. There appears to be a growing interest in the double-decker bus, as other agencies such as MARTA in Atlanta are demonstrating the double-decker bus.